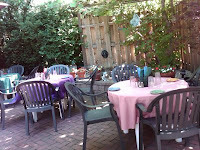 Guarino's Restaurant - 216-231-3100: It's Patio Season! The sun is out! The trees are in bloom!! Yes folks....it's patio season!! If you are like the many other Clevelander's looking to dine El fresco look no further!! Guarino's has one of the largest patios in the city featuring bright tablecloths with floral centerpieces, a water fountain, authentic grape vines, and many other unique touches that make our patio the BEST in town! If you cant make it in before sundown, the patio is also equipped with outdoor space heaters to keep the evening chill away! Stop in today and see what all the buzz is about! We can't wait to serve you! !